Following the KAOSS PAD entrancer (the audio/video effect processor that has earned a major following with VJs and video artists for its intuitive touchpad interface) Korg now unleashes he Krossfour. Packed into a compact body, its simple layout is optimized for realtime operation, giving you intuitive and free control over any type of video source. In addition to simple mixing/switching, the krossfour offers luma-key and chroma-key effects, background color generation and more. When teamed up with the KAOSS PAD entrancer, you can now create Video mixing and switching effects that were not possible with the KAOSS PAD entrancer alone. 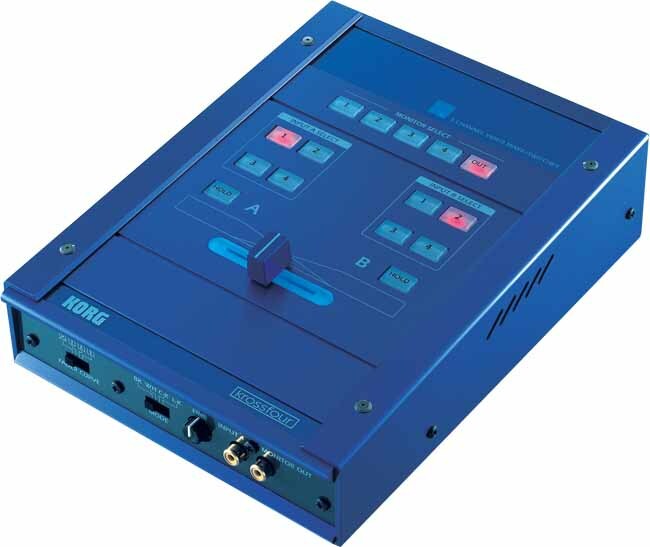 The krossfour is a four-input video mixer/switcher that lets you input and freely mix video from sources such as a DVD, VCR, video camera, or computer. In VJ work or video performance, you can use the crossfader to easily control video sources in musically meaningful ways. You can mix using one of four different fader curves. "Normal" curve gradually mixes between channels, "No Mix" transitions by fading both channels to black as you move toward the center, "Center Mix" mixes the channels only in the center, and "Switcher" switches the channels in the center. You can switch between these different curves to produce a wide range of video performances. The crossfader features a cool blue illuminated bezel for excellent visibility even in dimly lit clubs. Built-in TBC (Time Base Correction) converts signals played back from an analog VTR etc. into stable, digitally-synchronized images, ensuring smooth and glitch-free mixing. The Krossfour lets you create black/white and blue backgrounds as mixer sources. It also provides a chroma-key mode for removing the blue portions of the foreground image and allowing a different background image to show through (“blue-screen” effects), and a luma-key mode for removing portions of the foreground image that are a specific brightness (luminance) allowing a different background image to show through. There's also a HOLD switch that lets you freeze the input image. As a convenience for realtime video performance, the Krossfour provides a monitor out connector in addition to the main output. The monitor output can be used to audition a video input source before mixing, or as a sub-output for the mixed video signal. You can use Krossfour together with the KAOSS PAD entrancer audio/video effect processor. The design, illumination, and size of the Krossfour is designed to match the KAOSS PAD entrancer, making the two units a combination when placed side by side.